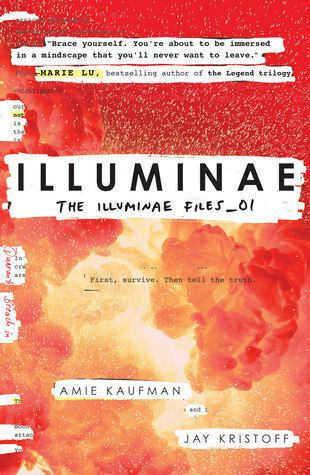 Illuminae is one of the most hyped up books of the year, and yes it does live up to its hype. It’s a story told through a blend of multimedia pieces — and if you’ve read my review for Night Film by Marisha Pessl, then you’ll remember how much I love this story telling format. Illuminae is a science-fiction adventure/action story set in space, full of twists, turns and heart-wrenching moments where you have no idea whether the characters would survive. Following the invasion of their planet by a large corporation called BeiTech, who’s after the minerals that are being mined there, Kady and her recent ex-boyfriend Ezra have managed to escape with their lives, saved by three spaceships that heard their planet’s distress call. Unfortunately, due to their narrow escape, the survivor’s main military spaceship, The Alexander, was damaged — and its AI (called AIDAN) begins to start making decisions on its own. What’s interesting is that while its decisions are viewed by the crew as an act of treason, the reader gets to glimpse inside the framework of AIDAN’s decision making, and logically, its actions make sense, as horrible as it sounds. What it did to save the fleet was its own sick way of saving them. I loved the concept of AIDAN — I’d go far enough as to say that it was my favourite ‘character’ in Illuminae. The fact that an AI can elicit such feelings of doom, yet hope for a little bit, is a testament to Amie and Jay’s great writing style. And can we just take a moment to appreciate all the effort that went into creating this book? At the Sydney launch event, Jay and Amie mentioned that they consulted with designers and experts when it came to having the blueprints of their spaceships drawn up. The level of detail that went into this book is amazing. And the art/story telling style! Words cannot express what a joy it was to read this book — because every new page was like a little surprise, you just didn’t know what to expect. And then there was the suspense. Oh, my heart. It felt like nothing was going right for Kady and Ezra, and their deaths were pretty much inevitable. I’ll be honest — not sure how they really survived haha. One problem I did have with the book (despite everything else being amazing), was the fact that I felt quite detached to both Kady and Ezra. Being the two main characters, I thought I would be more invested in them and their relationship — but I felt like I still don’t know them that well by the end of it. I guess this can possibly be attributed to the story telling style here — the readers do not get to really know them or their backgrounds, considering all the other things that are happening at the same time. I also didn’t buy their love story … sorry, but I just didn’t feel the spark there. Other than that small quip, Illuminae is definitely worth your time. Pick up a copy, I’m sure you won’t regret it! With thanks to Allen & Unwin Australia, I received an Illuminae poster signed by the wonderful Amie and Jay. Now, I’m not much of a poster person, so I thought this beauty would be better off in another home.